A lot of people find us in other-than-advertising. Referrals and recommendations are a big part of the puppy placement process. Repeats also play a huge part. 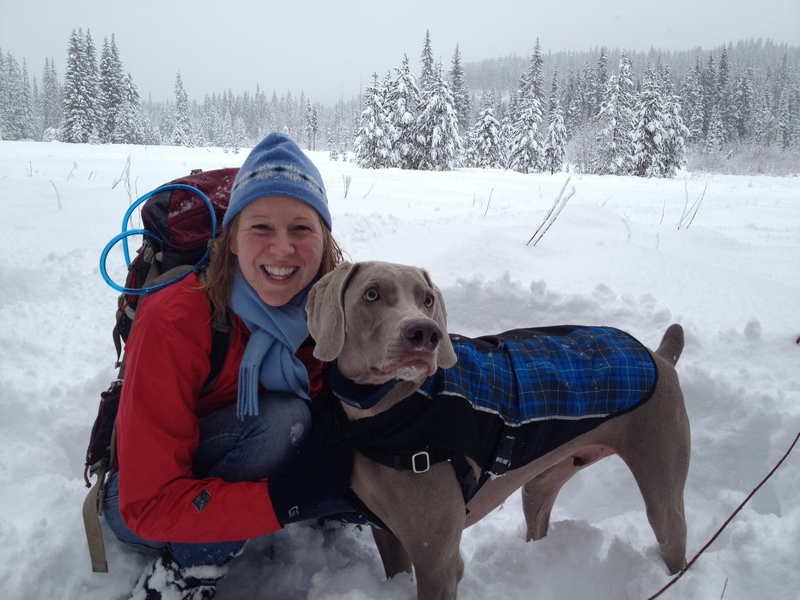 We have many families who have two OwyheeStar Weims, and even a few that live with three–we call these folks extreme Weimlovers. From Rebecca–I also wanted to give you a heads up that my friend Griffin has fallen in love with the breed after being friends with Winston for so long and hopes to get a blue Weim puppy in the near future. Keep your eye out for an application or email from him – he’ll be a great dog owner and his pup will have Winston to show him the ropes! 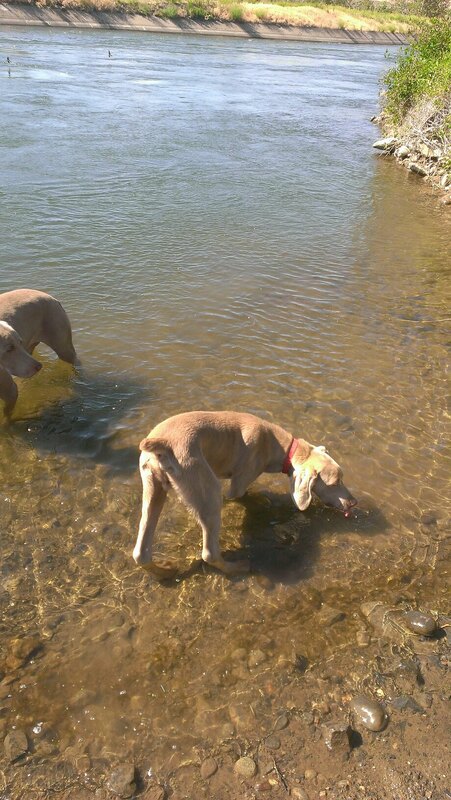 From Jim–(Both Weims are OwyheeStar Weimaraners) Just made it home after a stop in Portland for some meetings where Zeus and Samson stole the show. (Initial inquiry for a second OwyheeStar read….) We lost our Spinger Spaniel a few weeks ago and our home is just not the same without 3 happy dogs running around. Additionally, Lucy our Viszla is 11 and slowing down quite a bit. We have been so happy with Zeus, he is by far the best dog we have ever had; his temperament is incredible and when I am home he follows me everywhere. 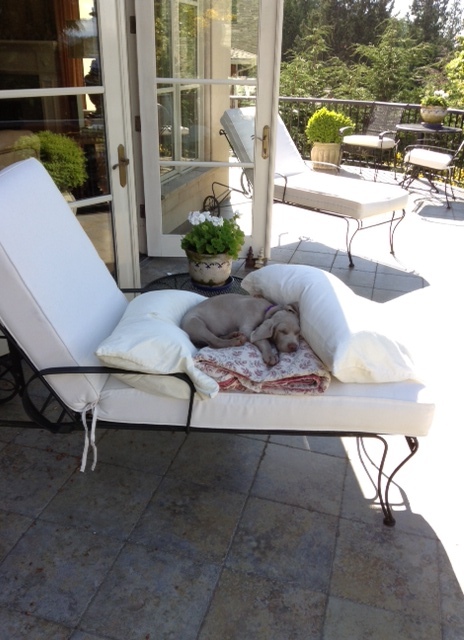 So we have decided we would like to add another Weim to our family this summer. It’s hard to believe that our boy Zeus is about to be 5 this summer. From Nancy — (Prior to Cooper’s Arrival we recieved this note for Cooper) Dear cooper: tomorrow you will come to your forever home with a big bed, lots of love and kisses and HUNTING. 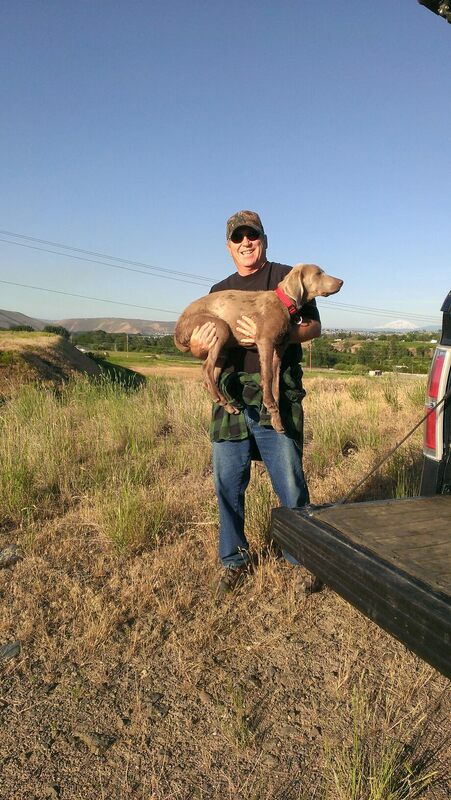 Ray carries the exhausted Cooper …. There are successful placements, along with your continued support (including recommendations) warm our hearts. 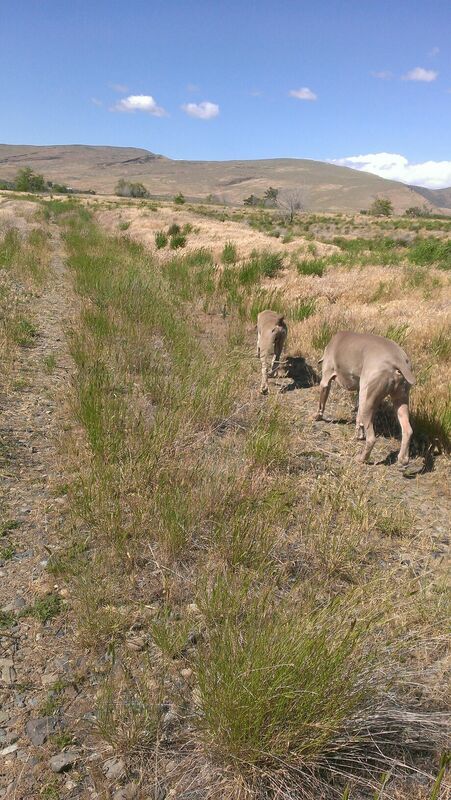 We listed only three recent families that referred or got a second OwyheeStar Weim; however, there are many more, which will soon grace our blog with their presence (or have recently done so). To mention a few…..
Jeff (Oscar of Calgary) has recommended us to Joe (also of Calgary) who is slated to pick up a longhair from Greta’s current litter. Thank you Jeff. Carrie’s friend fell in love with Dora (Chiloquin, OR ) and has contacted us about a puppy of her own. Marcy and Bob’s Wolfie (Omaha, NE) and their daughter also has an OwyheeStar Weim. She lived in Seattle when Milo was making plans to join their family, but since then they have relocated to Texas. This is the tip of the iceberg so to speak. Many of you have written about a future addition to your family. Others have alluded to friends who want their own. Some of you, have asked for extra business cards. Thank you all for everything. We do so appreciate it!